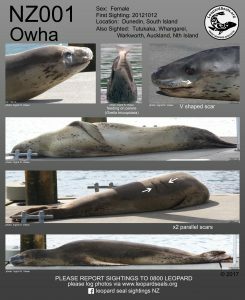 LeopardSeals.org has now gathered evidence to show that “Owha” the female leopard seal has been residing in New Zealand waters since at least 2012, when she was photographed off the coast of Dunedin (South Island). Since then she traveled north and was first recorded off the coast of Northland at Ruakaka on the 1st of June 2015. She has spent at least three years in the waters on the east coast of Northland and the Waitemata Harbour adjacent to Auckland city. Owha is short for her Māori name “He owha nā ōku tūpuna” which translates to mean “treasured gift from our ancestors”. She received this name from the local Māori hapu (sub-tribe or clan), Ngati Whatua ki Orakei, after she spent more than a year in their home waters. Currently, LeopardSeals.org has over 200 sightings of Owha. We have documented that she has ranged from Dunedin to Tutukaka (Northland). We are preparing a scientific report about her movements and other information we have gathered about her. 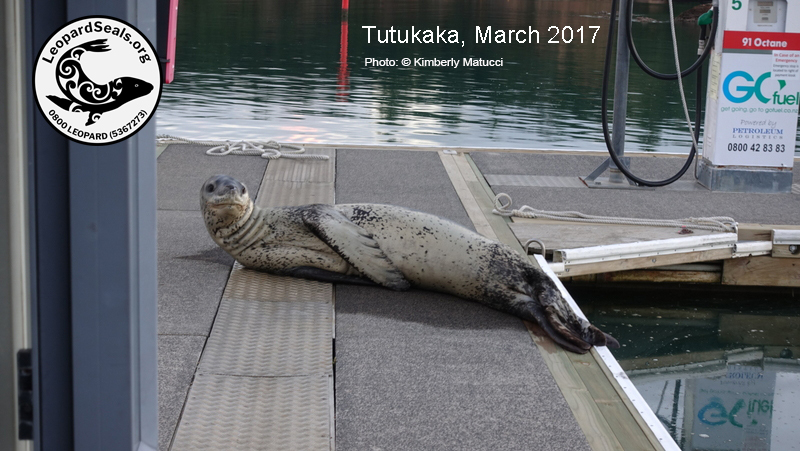 She was the first leopard seal entered into the New Zealand Leopard Seal Identification Catalogue due to all the data that we have gathered about her. Owha particularly likes hauling out and resting on marina pontoons. 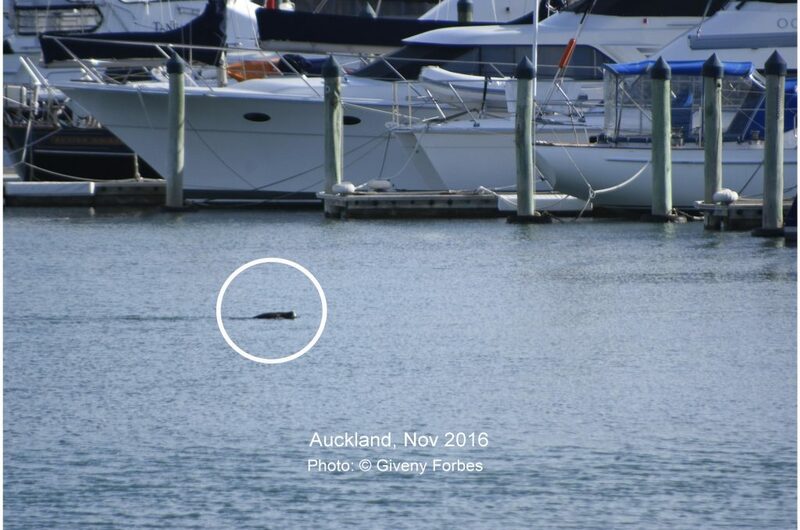 She has been documented at the Auckland Outboard Boating Club Marina, Westhaven Marina, Bays Water Marina, WestPark Marina, Te Atatu Boating Club, Gulf Harbour Marina, Sandspit Marina, Tutukaka Harbour Marina and Marsden Cove Marina. If you find a leopard seal in a marina, particularly on the narrow marina pontoons, do not approach without first seeking the Marina Management team and asking about their protocols. If they or you have concerns, please contact us on 0800 LEOPARD (0800 5367273) and we can advise you about other marina’s protocols. Owha, hauled out on the fuel jetty at one of the many marinas she has visited around our coastline. Additionally, please note that because she likes visiting marinas, she is also vulnerable to boat strike – please do not approach closer than 20m in your boat and please slow down if you have sighted her. She can be very difficult to spot as very little of her body or head typical protrude above the water surface. Owha the leopard seal swimming near boats in a marina. Her low profile makes her very susceptible to boat strike, so please slow down if you see her. 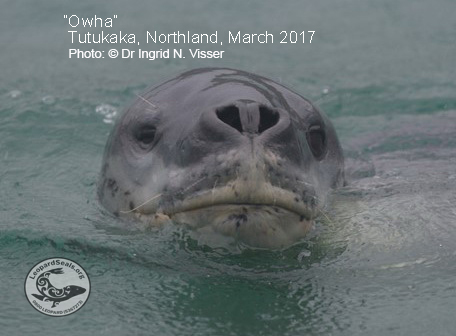 No doubt Owha has also visited more marinas than we have recorded, whilst she traveled up the coasts of the South and North Islands. If you have any photos of a leopard seal in a marina, we would be interested in viewing them so we can try and match them to her. We ask that you please report any sightings of leopard seals (including historic ones) to us in order to help us better understand and therefore protect Owha and other leopard seals who visit and reside around our shores.